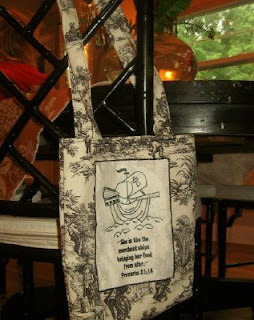 Look at the fabulous merchant tote Monica made for me! Visit her picture-rich tutorial at Homespun Heart, part of her crafter's walk through Prov. 31. What a cute tote and how very special! I am headed over to her site to take a peek. I swoon over anything toile! So pretty! You know, when I saw that on her blog the other day, I thought of you and how it would be perfect for you! Monica has such a generous heart. That is such a pretty bag. I went over and checked out her tutorial too and she makes it look really easy to make. I bet that would be absolutely gorgeous if you embroidered it onto something as well!! That's gorgeous! :) What a thoughtful gift! I'm headed over to her blog now to check it out. I, too, thought of you the moment I saw that on Monica's blog. What a thoughtful and generous gift! The toile is just beautiful and the embroidery even better.